I got the idea for this one off weheartit, which led me to a page on this blog. I think it's so cute! And actually quite simple to do. However, simple is not equal to quick, and it still took quite a while. 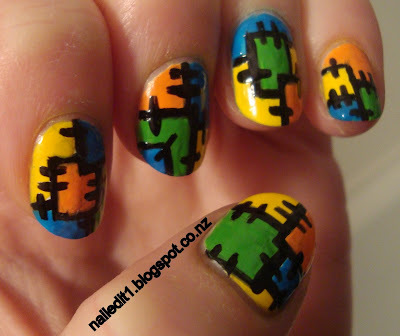 If anyone else tries this, make sure you use colours that are completely opaque! I had to go over mine about three times for some of the colours, which was the biggest problem time-wise. I don't have any photo tutorials for this one, but I'll try to start doing them properly soon. 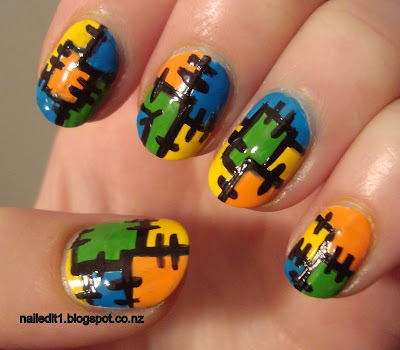 Another girl who did these nails did a tutorial actually, which is how I figured out how to do it. If you want to give it a try you can find it here. I like the other blogger's versions of these better, I must say. Mine are a bit crazy and bright. However, bright = very noticable! I'm getting used to people in town commenting on them anyone, but I've had three separate shopkeepers notice them in the last 24 hours! They were awesome too, and one suggested I carried around cards with links to my blog so they can see others. I'm still not too sure about this idea, I'd feel a bit forward. But once I get tutorials going properly I'll think about it seriously - then it can help then, instead of just giving me views. Not that I mind that, haha. Oh, and if anyone was wondering, these were just done with cheapie nail polishes. Jordana white, orange and a black striper brush, LA Colors yellow, CR green and blue. Guess what? My new China Glaze polishes that I ordered a couple of weeks ago have arrived and they are SO COOL!! Plus I found more Revlon nail polish on sale (30% off) and got two, including one called Emerald City, which has a Matte finish which I'm very excited about! So my next post will probably be a whole bunch of swatches. 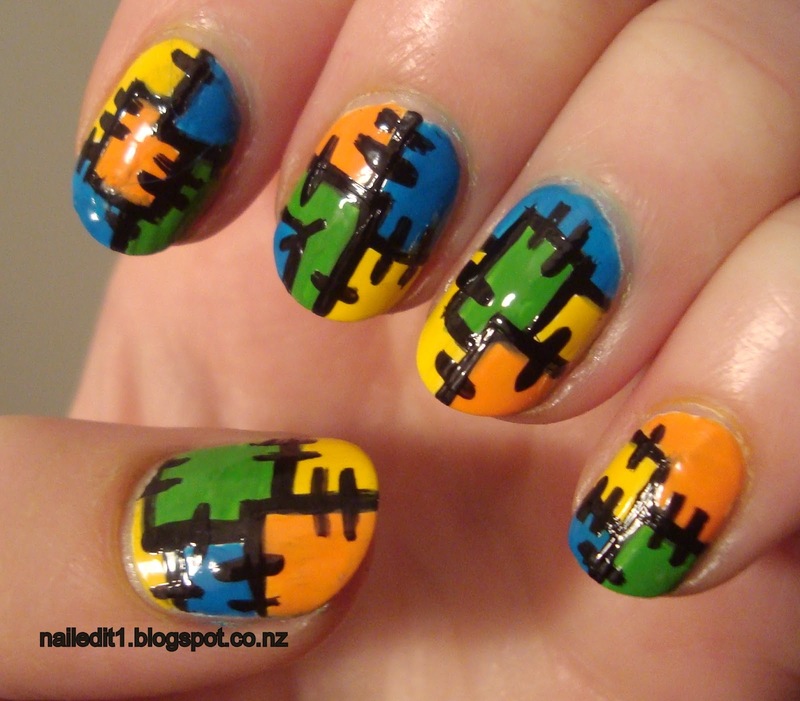 Oh, and if anyone does another version of these nails feel free to post a link to your one! I don't like links normally, but it's totally okay if it relates to the post. If you don't have a blog you can post it on my facebook page too. Cute eh? You should do them! Thanks! It's actually a lot easier than it looks. I'm going to do an easy photo tutorial for it soon.